A temple addicted to whiskey. This temple prohibits devotees from giving prasad to beggars. After all, the pooja thalis here look tempting with their Royal Challenge bottles. The deity, though, is perhaps soft on Johnnie Walker. Clinging to the stone-red ramparts of Purana Qila, Bhairon Mandir is an alcohol-friendly shrine. The temple accepts liquor as prasad. A signboard that warns not to give it to beggars outside is mostly ignored. The drunken urchins freely run around with half-empty bottles. “Devotees bring their own bottles, sometimes even cartons,” says beer-bellied Pandit Ram Prasad. The tradition is to offer some of the whiskey (or beer, vodka, rum…) to the deity. The rest is given to the priest or taken home. 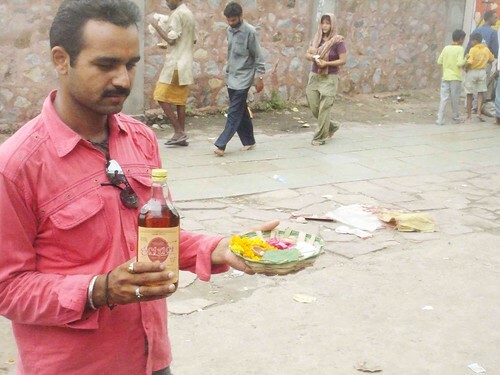 Since Bhairon Baba, a demon killed by Durga but absolved of all sins during his dying moments, attracts the biggest crowd on Sundays, the sweeper claims to collect more than thousand bottles the morning after. An offering of meat is also acceptable. According to a priest, it is not unusual to proffer live chickens as well. This tipsy tradition is traced to Baba’s fondness for alcohol. But an old Mataji, a temple fixture, recalls the time when the surrounding area was a jungle. Picnickers would come from Delhi, in tonga, to picnic here. Since the area was thick with trees, they would chop wood and light bonfires to rustle up elaborate meals. Booze would inevitably be part of the hamper. Considering that the temple priests were never far away, they were often invited to share in the feast. This custom perhaps evolved into the present-day ritual. “The truth is that meethi roti is prasad enough,” Mataji asserts. But that, as it happens, is not enough for others. With all due respect to the venerable “<>Mataji<>“, the use of intoxicants in the worship of Lord Bhairava is probably as old as the cult itself. “<>Keshi vishasyapaatrena yad Rudrenaapibat saha,<>” to quote the Rig Veda itself, where the context almost certainly indicates ‘visha’ as some kind of a drug. (Although one might argue that drugs <>are<> poison! )I do, however, question your choice of words, some of them anyway. If nothing else, a “bar” is, generally, a commercial enterprise whereas here the stuff is, literally, being given away. And would you, oh Politically Correct One, ever refer to the wine used in a traditional Christian sacrament as “booze”? Not that the use of external intoxicants should come as a surprise anyway to someone who named himself “Soofi”…Finally, haven’t you confused two distinct mythic cycles, that of Lord Bhairava as he is worshipped across India with the localised legend of the demonic ascetic Bhaironnath of Vaishnodevi? Ajit, <>The Delhi Walla<> never intended to offend the religious sensibilities of readers. The term ‘bar’ has been removed. As for confusing the myth, the deity here is not Shiva. The story was told by a Bhairon Mandir priest. Mayank, beautifully written as usual. And great handling of a confrontational comment. I think it is important to experience & then comment.